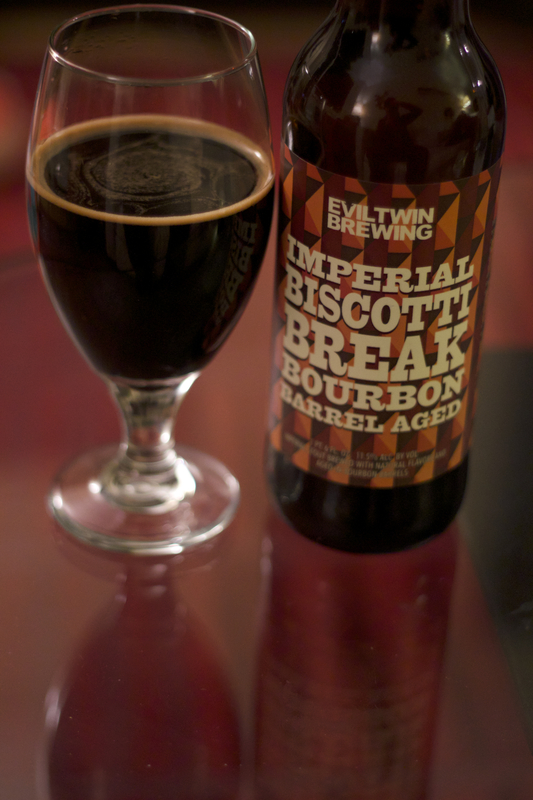 One of the best stouts around—Imperial Biscotti Break—is brewed by Evil Twin’s Brooklyn-based brewmaster Jeppe Jarnit-Bjergsø, originally from Denmark. He’s been dubbed a “gypsy brewer,” because he doesn’t have a home-base brewery, but instead travels to different locations to brew his beers. Last year, Jarnit-Bjergsø opened the craft-beer bar Tørst and accompanying restaurant Luksus in Greenpoint, Brooklyn, where many of his world-class beers are featured on draft and in bottles. 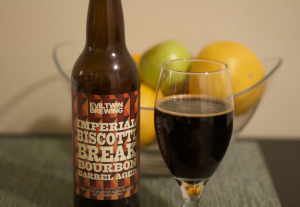 Imperial Biscotti Break is an Imperial stout brewed at Westbrook Brewing Co. in Charleston, South Carolina. Since Biscotti Break’s release, Jarnit-Bjergsø has made several versions, including a recent one including the addition of actual doughnuts. On the day that Jarnit-Bjergsø answed my questions, Imperial Biscotti Break was named by the beer-ranking website RateBeer as one of the top-100 beers in the world. Where’s The Beer NY: First off, congratulations on Imperial Biscotti Break being named one of RateBeer’s top-100 Beers. Care to comment on the honor? Jeppe Jarnit-Bjergsø: I would like to thank my mom, without her … just kidding! It’s of course an honor to have a beer on the list of one of the most important beer sites in the world, but I also know that this list, just like any other list, isn’t the only truth in this world. But yeah, of course I’m happy about being on it! WTBNY: Were there any general inspirations that led you to brew the Biscotti Break line of beers? JJB: My friend Ryan (a brewer at Fanø Bryghus in Denmark where Biscotti Break was brewed for the first time) and I were going to a beer festival on a cruise ship between Rome and Barcelona. We wanted to brew something special for the festival and decided that biscotti would give the Italian side of the festival something they could relate to. For the Spanish side, we aged some of the beer on Spanish Black Foot ham. WTBNY: When you give your beers situational names, like Biscotti Break, or Christmas Eve At A New York City Hotel Room, for example, how do you decide on the name? Do you picture a person drinking the beer in the situation and set out to make the beer that’s perfect for the situation or does the beer come first and its flavors inspire the name? JJB: Most of our names are creations of my wife who is a very talented copywriter. Some of them are mine, and they are actually just names that come to me. For Christmas Eve at a NYC Hotel Room we actually did spend Christmas Eve at a Hotel Room in New York City years back. The situation was so unique that when I made this beer for Christmas I thought it would be a fun name to use. It tells a story from my life. WTBNY: Do you always add the same coffee to Biscotti break? JJB: Yes, we work with a local coffee roaster in Charleston, SC, where the beer is brewed. I like to use local ingredients (for Imperial Doughnut Break we use doughnuts from a local doughnut maker). The coffee is brewed fresh when we add it. WTBNY: What types of malts do you use in Biscotti Break? JJB: We use 2-row as base. That’s our base for most of our beers. Besides that we use a mix of different malts such as Chocolate, Abbey, Melanoidin, Cara and some oats. WTBNY: Does the base beer recipe vary depending on the variant of Biscotti Break you’re brewing? JJB: The base recipe is always the same, but the beer is perfect to play around with, since the base is really good. WTBNY: How did the DeCicco’s collaboration come about? JJB: They approached me asked if I wanted to make a beer for them since they are huge supporters of Evil Twin. I know the guys and like them and it made sense. It also made sense to do something with Biscotti as it is an Italian supermarket! WTBNY: What type of cherries did you use to brew Imperial Biscotti Break Natale: Pretty Please With A Cherry On Top? JJB: Sour—I think sour cherries work best with an already sweet beer. WTBNY: In Natale’s full name “cherry on top” suggests that the stout has a hint of cherry flavor. Is that an accurate description of what you are aiming for with this version of Biscotti Break? JJB: I tend not to do anything overpowering in my beers. I didn’t want a “fruit beer,” but a porter with fruit flavors, so the cherry is there in the background but not overpowering. WTBNY: I just had the Bourbon Barrel Aged version of Biscotti Break yesterday and really enjoyed it. What Bourbon Barrels did you use to age the beer? How long was it aged? JJB: It was aged 9 to 10 months. I’m actually not allowed to say what kind of barrels. WTBNY: You use a lot of very unique and unusual ingredients in your beers—Imperial Doughnut Break is a good example. JJB: We did it because it made sense. It’s like drinking a liquid doughnut with coffee frosting. WTBNY: Who made the doughnuts? JJB: Glazed Gourmet (http://www.glazedgourmet.com/)—an awesome little shop that really experiments with doughnuts and make some fun stuff. A fun little story is that they normally produce 600 doughnuts each day, but when we ordered for Imperial Doughnut Break, we ordered 1,000 at the time. Our order almost tripled the day’s production! WTBNY: There were 997 doughnuts added per barrel, correct? Any significance to the number? JJB: No, we actually had 1,000, but Mike Levin, who works at Westbrook Brewing where we made the beer, ate three of them. WTBNY: What flavors were you hoping and/or expecting the doughnuts to impart on the beer before you brewed the beer? JJB: We had already made a test, and we wanted it to taste like a doughnut in liquid form. I think we achieved that! WTBNY: You used glazed doughnuts for this version. Are you planning to use other types of doughnuts in the future, like jelly doughnuts? JJB: For now we will use glazed as it works really well. We plan to do a “single doughnut series” that we will present at certain festivals, mostly to imitate our single hop series. WTBNY: You say in the description on your website that the doughnut is an “all time American favorite.” Are there any other American favorite foods that you’re planning on/would like to brew with for any of your beers? JJB: Good question! I don’t like to be crazy just for the sake of being crazy, it has to make sense and I have to believe it does something good to the beer, otherwise I won’t do it. We have used cornhusk before—that is also pretty American. We did that to add sweetness—burned cornhusk tastes almost like cotton candy. I’m not going to be adding burgers or pizzas in the future, but if I come up with something that makes sense I might try it out! WTBNY: Are there any other variants of Biscotti Break coming up? Any other ingredients you’d like to eventually add to Biscotti Break? JJB: Nothing planned yet. I have another beer—Femme Fatale—that I’m experimenting with now, where we will do different versions. We have already done four kinds: normal, dark, single hop Nelson Sauvin, and with Yuzu.